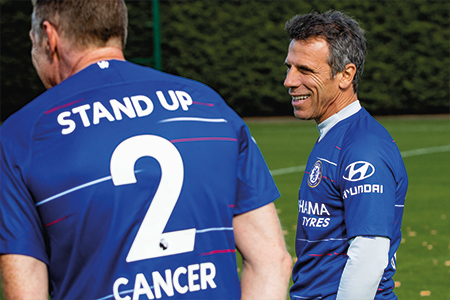 As an official partner of Chelsea FC and Stand Up To Cancer, we wanted to use the power of football to help the 2.5 million cancer patients in the UK and ‘Give Cancer a Kicking’, with the help of some famous faces. Chelsea players David Luiz, Gary Cahill, N’Golo Kante, Victor Moses and Davide Zappacosta, were joined by Blues legends Gianfranco Zola, Carlo Cudicini and Katie Chapman, as well as celebrity fans, comedian Omid Djalili and actor Jason Flemyng, as they took on a unique accuracy challenge, taking aim to smash ‘cancer’ targets hanging from drones at the club’s training ground in Cobham. Zola, the club’s assistant manager, stole the show with his fine shooting as he joined the players in successfully destroying the targets during the challenge. Despite showing off their football skills, Omid Djalili and Jason Flemyng had mixed results on the day. The Italian’s heroics didn’t finish there though, as he surprised 18-year old Blues fan and cancer survivor, Ed Garside, with a pair of tickets to the Premier League clash against Manchester United this weekend. Ed was invited down to London thinking he was getting a routine tour around Chelsea’s stadium, Stamford Bridge, only to be surprised by his footballing idol who also joined him for a quick kickabout. This work with Stand Up To Cancer and Chelsea is part of wider fundraising activity ahead of the weekend’s Premier League fixture vs Manchester United where we’ll be donating some of our matchday rights to help encourage fans to help ‘Give Cancer a Kicking’ and donate this autumn. Stand Up To Cancer, the joint national fundraising campaign from Cancer Research UK and Channel 4, has raised more than £38million, funding 35 trials and projects involving more than 8000 cancer patients. Hyundai are proud to join forces with Cancer Research UK to inspire the nation to raise money for life-saving research. If you are attending the Chelsea v Manchester United game at Stamford Bridge on Saturday, you will have the chance to ‘Give Cancer a Kicking’ yourself outside the West Stand entrance in a special challenge from 10am – we’d love to see you down there. To find out more or to donate, visit standuptocancer.org.uk or text HYUNDAI to 70404* to donate £5.